In Kerala, it is known by the name panam kalkandam, whereas Telugus identify it by the name thaati bellam or nalla bellam. It is also widely used in Thai cuisine and is popularly known as nam taan peep. It is acquired from the flowers growing high on coconut trees, which are opened to collect liquid flower nectar. This nectar is then air-dried to form a crystalline sugar that's naturally brown in color. Palm sugar is considered as a low-glycemic crystalline sweetener that looks, tastes, dissolves, and melts almost exactly like sugar, but is completely natural and unrefined. It is a rich source of vitamins, minerals, and phytonutrients including potassium, zinc, iron, and vitamins B1, B2, B3, and B6. Apart from that, the Palmyra Palm Sugar is the only known plant–generated natural source of Vitamin B12. 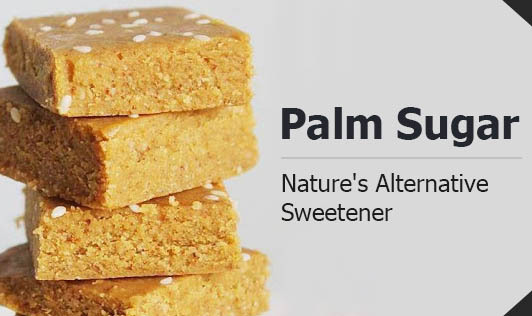 Palm sugar is a very effective body coolant thereby making it a better alternative to the ordinary refined sugar. It can also be used to treat coughs, heal lungs, and treat throat infections, anemia, leprosy, typhoid, and high blood pressure, and strengthen the bones. It contains approximately 86% sweetness as compared to white sugar and a glycemic index of not more than 35. This makes it a healthy alternative to sugar in all dishes. One word of caution is that it cannot be used in very hot teas and milk as it can result in the milk turning bad. So, make sure to use it with cold milk or lukewarm drinks. Luckily, no after taste is experienced in palm sugar. I would like to conclude that though palm sugar has several benefits, it is still a source of calories therefore use it wisely.